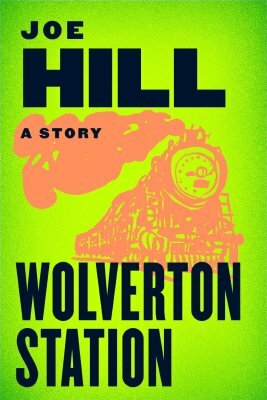 Wolverton Station reads like an episode of Twilight Zone; a lone businessman travelling on a train suddenly begins seeing wolves everywhere. And that’s about all the plot there is in this short story by Joe Hill, but hey, if the writing’s good, that’s enough. And the writing’s stellar. Hill puts the main character, Saunders, from one unpleasant situation to another with glee, first giving him a glimpse of a fellow first class passenger (a businesswolf!) and then locking him in a train toilet in a feeble attempt to hide from the plebeian wolves in the economy class. It may all be a dream, or a result of a nervous breakdown; there’s a lot of background on Saunders, a ruthless businessman on a mission to establish a chain of Starbucks-style coffee shops around Britain (mostly by forcing existing shops out). As he’s already living on an eat-or-be-eaten philosophy, it’s not much of a leap for it to become a literal reality for him. Originally published in an anthology in 2011, Wolverton Station is a fine, fast, fun read; it’s not really much else, nor does need to be. Available now as a Kindle Single from Amazon. Visit the author’s site! 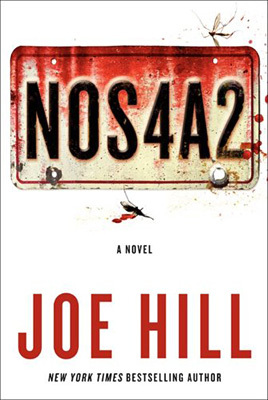 Christmas comes early to horror fans courtesy of Joe Hill‘s third novel, NOS4A2 (2013). A truly original horror novel brought to life by first rate storytelling, NOS4A2 (or Nosferatu) is the tale of biker chick Vic McQueen, who as a young girl discovers that she can create a portal that looks like a dilapidated covered bridge. Riding her Raleigh bike through the Shorter Way bridge takes her anywhere in an instant, enabling her to find items that have been lost. But there are others with similar talents. Enter Charlie Manx, a vampiric centenarian with a sweet 1938 Rolls-Royce Silver Wraith (bearing the titular vanity license plate) and a mission to save children everywhere. With his renfields Manx takes the children to a place beyond reality called Christmasland, where every day is Christmas and the children never age. Instead, they grow new teeth and lose their humanity. Vic comes across Manx but escapes, bringing about his downfall and imprisonment in the process. Years later, after Manx’s death and autopsy, he wakes up and comes after Vic and her son, Wayne. And then it’s on, the Wraith versus Vic’s new ride, a Triumph motorbike, in a race for Wayne’s soul. The tale’s definitely in the telling in NOS4A2. There’s the horror, for sure, but there are also elements of fantasy and pitch black humour. Hill’s prose is impeccable, with a lively rhythm and pace that make the nearly 700-page story fly by. The characterisations are impressive, full of personality and elaborate, minute details; Vic’s boyfriend Lou Carmody, an overweight, comics-loving grease monkey being a particularly joyous creation. Even tertiary characters receive wicked back stories, such as the morgue attendant who takes pictures of himself with famous corpses. There’s a richness to the novel, a grand tapestry of characters, events and details that can’t be adequately expressed in a short review. And what a villain the novel has in Charlie Manx, a man with 19th century speech patterns and an aversion to dirty language. The self-anointed saviour of children is doing what he thinks is best for the little ones, never mind evidence to the contrary. He’s a hero in his own right, but his heroism is of a twisted, rotten kind. Much like clowns in horror fiction, all things Christmas become creepy, unnerving experiences in NOS4A2. Manx’s idea of happiness is Christmas, so his sanctuary of eternal bliss is a theme park dedicated to Christmas. The Wraith, his transport to Christmasland, only plays Christmas songs on its radio. Manx’s rhyming manchild helper Bing Partridge gases the children’s mothers with an anesthetic that has a whiff of gingerbread in it. Oddly, the overbearing, force-fed sweetness of Manx’s Christmas isn’t that far off from reality, with commercial Christmas taking over every store and shopping center from November onwards, every year a little earlier, every year a little more, a little piece of Christmasland for you and for me.